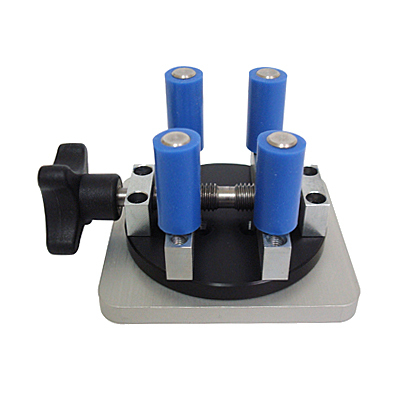 The TMS container grips fixture is used in tests where semi-solid or thick liquid samples are analyzed in their consumer packaging container or other collection vessel. Four soft grip rubber arms hold containers from 10mm to 70mm in diameter firmly. 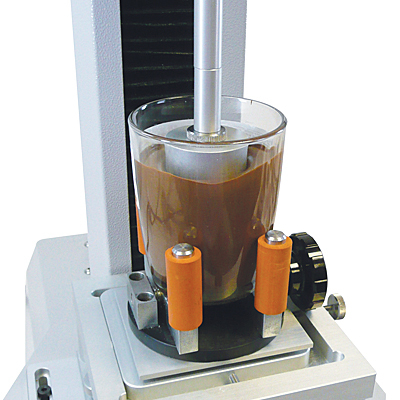 This is critical in measuring adhesion properties of viscous liquids during the return (tension) cycle of testing, where prevention of lifting is required. Presenting the sample within its supplied container is especially useful when doing extrusion or penetration testing on thick liquids - grips eliminate the variability that would be caused by disturbing the product when moving it to a different container. It also speeds up the testing process by eliminating extra steps.